An MBE rounds off what has been an amazing year for sponsored rider Sophie Wells. The paralympic rider sponsored by Asmar Equestrian has been honoured by the Queen in the New Year’s Honours list after Sophie contributed hugely to the success of Equestrian sport at London 2012. The grade IV rider gained individual silver on Dr Jackie and Dr Neil Walker’s horse Pinocchio in both the freestyle and individual tests which are approximately equal to the complexity of a Prix St George level test. Sophie also won her team test contributing her high score to the overall Team Gold placing. Nottinghamshire based Sophie Wells is not just your average rider, from a non horsey background Sophie has managed the rare condition; Amniotic Band Syndrome, alongside riding, which affects blood flow, development and movement to achieve success at National, European and now Olympic level. Modest and humble as ever Sophie said “I’m so proud to say that I have been awarded an MBE!!! It’s so exciting and I can’t believe it! I definitely think this honour should be shared with my amazing horse Pinocchio and my fantastic coach, Angela Weiss.” about receiving the honour. Supplying Sophie with the finest equestrian clothing Asmar is available online at http://www.asmarequestrian.com and from a selection of retailers. Asmar Equestrian designs a range of quality, stylish riding apparel suitable for day-to-day and the show ring. The entire range incorporates classic beauty, fashion and optimum functionality for riders who deserve the best. 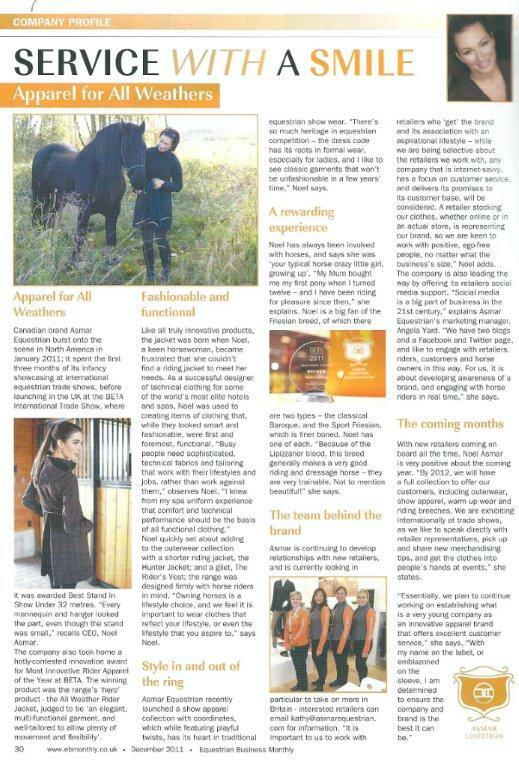 Equestrian Business Monthly mag showcases Asmar Equestrian with a full page feature – read it here! Canadian brand Asmar Equestrian burst onto the equestrian scene in North America in January 2011; it spent the first three months of its infancy showcasing at international equestrian trade shows, before launching in the UK at the BETA International Trade Show, where Asmar Equestrian was awarded Best Stand In Show Under 32 metres. “Every mannequin and hanger looked the part, even though the stand was small,” CEO Noel Asmar recalls. The company also took home a hotly-contested innovation award for Most Innovative Rider Apparel of the Year at BETA. The winning product was the range’s ‘hero’ product – the All Weather Rider™ Jacket, judged to be ‘an elegant, multi-functional garment, and well-tailored to allow plenty of movement and flexibility’. Noel quickly set about adding to the outerwear collection with a shorter riding jacket, the Hunter Jacket; and a gilet, The Rider’s Vest; the range was designed firmly with horse riders in mind. “Owning horses is a lifestyle choice, and we feel it is important to wear clothes that reflect your lifestyle, or even the lifestyle that you aspire to,” Noel says. Asmar Equestrian recently launched a show apparel collection with coordinates, which while featuring playful twists, has its heart in traditional equestrian show wear. “There’s so much heritage in equestrian competition – the dress code has its roots in formal wear, especially for ladies, and I like to see classic garments that won’t be unfashionable in a few years’ time,” Noel says. Noel has always been involved with horses, and says she was ‘your typical horse crazy little girl, growing up’. “My Mom bought me my first pony when I turned twelve – and I have been riding for pleasure since then,” she explains. Noel is a big fan of the Friesian breed, of which there are two types – the classical Baroque, and the Sport Friesian, which is finer boned. Noel has one of each. “Because of the Lipizzaner blood, this breed generally makes a very good riding and dressage horse – they are very trainable. Not to mention beautiful!” she says. Asmar is continuing to develop relationships with new retailers, and is currently looking in particular to take on more in Britain – interested retailers can email kathy@asmarequestrian.com for information. “It is important to us to work with retailers who ‘get’ the brand and its association with an aspirational lifestyle – while we are being selective about the retailers we work with, any company that is internet-savvy, has a focus on customer service, and delivers its promises to its customer base, will be considered. A retailer stocking our clothes, whether online or in an actual store, is representing our brand, so we are keen to work with positive, ego-free people, no matter what the business’s size,” Noel adds. The company is also leading the way by offering its retailers social media support. “Social media is a big part of business in the 21st century,” explains Asmar Equestrian’s Marketing Manager, Angela Yard. “We have two blogs and a Facebook and Twitter page, and like to engage with retailers, riders, customers and horse owners in this way. For us, it is about developing awareness of a brand, and engaging with horse riders in real time,” she says. With new retailers coming on board all the time, Noel Asmar is very positive about the coming year. “By 2012, we will have a full collection to offer our customers, including outerwear, show apparel, warm up wear and riding breeches. We are exhibiting internationally at trade shows, as we like to speak directly with retailer representatives, pick up and share new merchandising tips, and get the clothes into people’s hands at events,” she states. It was the trot up day, so I rode in the morning, and it was absolute chaos. People jumping, tractors in the warm up, which was only about 30×30 with a pillar in the middle. At one point, everyone had to go around the same way until someone shouted to change the rein and everyone proceeded to go in the other direction, it was incredible, and like nothing I had ever seen before! However, it made me access my warm up as it was limited what I could do, and made us concentrate more on ourselves rather that the other 50 horses around us. Noki was a saint and trotted next to people leaping over jumps, and was not phased in the slightest. It was almost as if he got into his own zone too. The trot up went well, and my trainer Ange did a great job with turning him out so smart, I had clipped him the day before we left which helped, but the pressure was on to get every single hair! We then headed back to the hotel for an early night as my class was in the morning the next day, and I wanted to do the arena walk at 6.30 to get him into the arena again. The arena walk was also amazing as we were in at the same time as the senior dressage riders were training; so many famous faces, and horses to admire and get inspired by. I was drawn straight after the break in my class, but just before the break was the European champion, German rider Sanneke Rothenburger, which was quite a tough draw. However we didn’t let anything phase us and Noki warmed up really well. We put the double bridle on half way through to let him get used to it, but he was opening his mouth quite a lot. I much prefer to ride in a snaffle, as I can hold the reins better; Noki feels more comfortable in a snaffle, but for international able bodied competition, it is compulsory. Visit www.asmarequestrian.com for details of our clothing range. Man of the moment, GB’s Carl Hester, had a miracle ride with the 10 year old stallion Uthopia to claim a second silver medal in today’s grand prix freestyle. The result crowns a stellar week for Hester and the dressage team who have enjoyed their most successful championship after the team took the gold on Thursday for the first time in dressage history as well as silver and bronze in Saturday’s grand prix special. The result comes at a championship where the sport itself has reached new highs; each of the podium winners rode personal bests to take their titles in emphatic style. Yesterday’s champion Adelinde Cornelissen was the convincing winner for the home nation (NED) and rode a faultless test for 88.768% with Jerich Parzival. Swedish rider Patrick Kittel clinched the bronze with Watermill Scandic H.B.C on 83.429%, just 0.383 ahead of Britiain’s Laura Bechtolsheimer and Mistral Hojris in fourth. 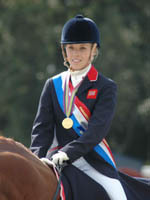 The European Championships are the last senior dressage championship in Europe before next year’s Olympic Games in 2012. The hard won results here put Britain firmly on the map to be in the medal shakeup next year.